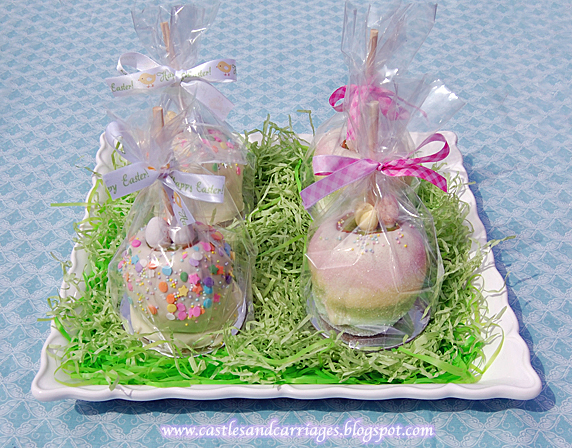 I am loving these caramel apples dipped in white chocolate for Easter. I will be dropping these off at my husband's work tomorrow. 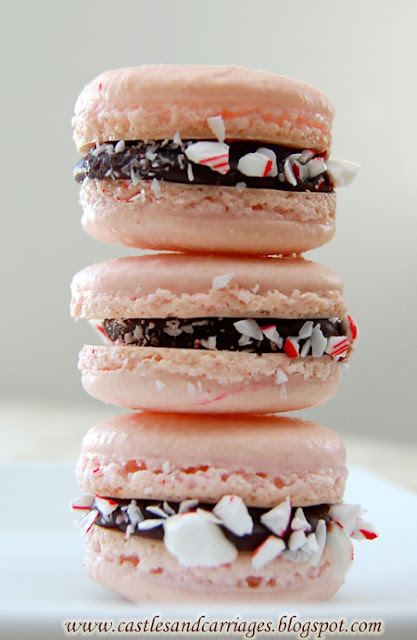 They are incredibly easy to make. You'll need some caramels (for 6+ apples, I needed two 11 oz bags of Kraft Caramels), a few tablespoons of milk, white chocolate chips (almond bark or Wilton's candy melts is also fine to use), sprinkles, wooden caramel apple skewers, two heat safe bowls (I used two pyrex liquid measuring cups) and apples. 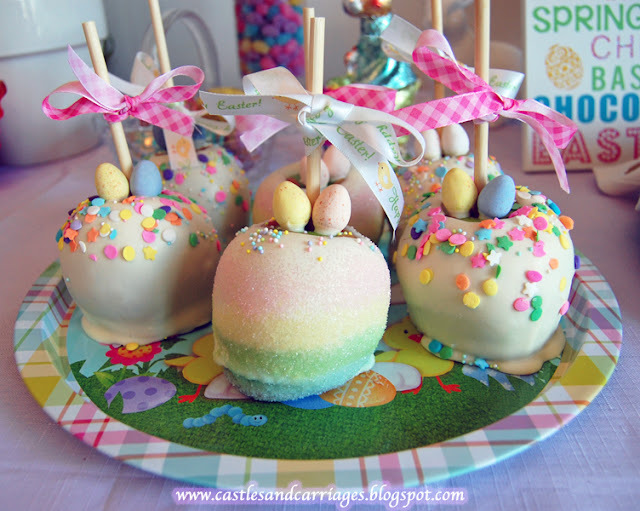 I used some Cadbury Mini Eggs as the bunny ears on top of my white chocolate caramel apples. I used organic apples because they don't have an outer waxy layer, they're generally smaller (better suited for kids!) and it's nice not having to worry about pesticides. It's really important to keep your apples cold during this process. If your apples are at room temperature then it's likely that your caramel/white chocolate will take a bit of time to set and you'll probably end up with a lot pooling at the bottom of the apple. 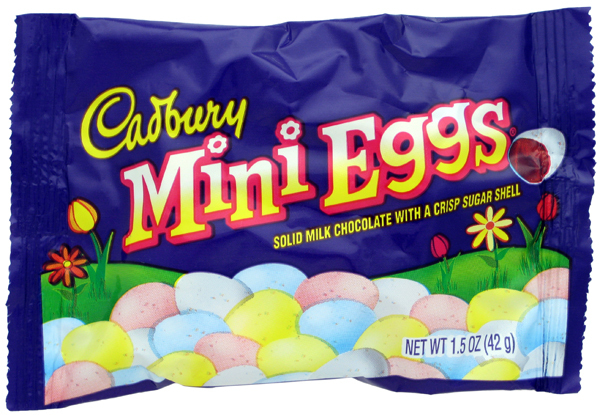 - Optional: Ribbon, clear plastic treat bags if giving away. Wash apples then put into refrigerator if they are not already chilled. I had mine in for an hour. 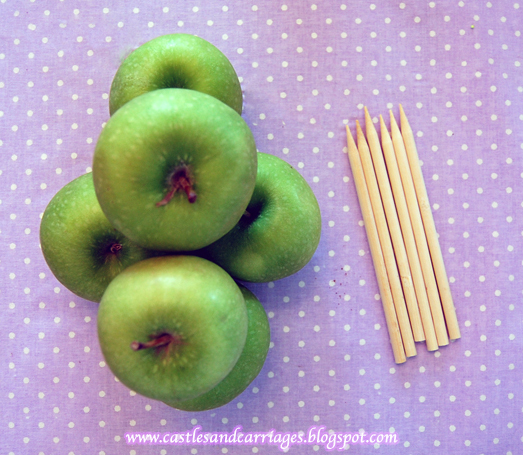 Put the caramel apple skewers into each apple. Heat one bag of caramels in a heat safe bowl (or pyrex measuring cup like I did) for 1 minute in the microwave with 2 tablespoons of milk. Stir then microwave for another 45 seconds. Stir again. Dip the caramels, allow the excess to drip off then place onto a sheet of parchment/wax paper. Allow to cool and set in the fridge. (I left mine overnight). Heat the white chocolate chips in a separate heat safe bowl for 30 seconds at a time, stirring then heating until everything melts. 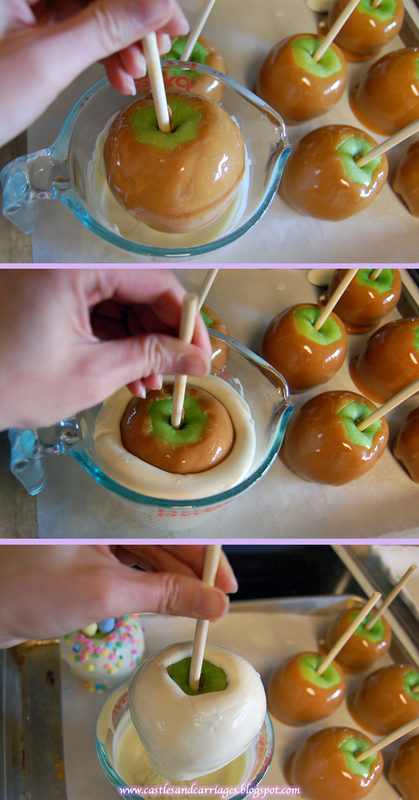 Dip the caramel apples in then allow the excess to drip off. 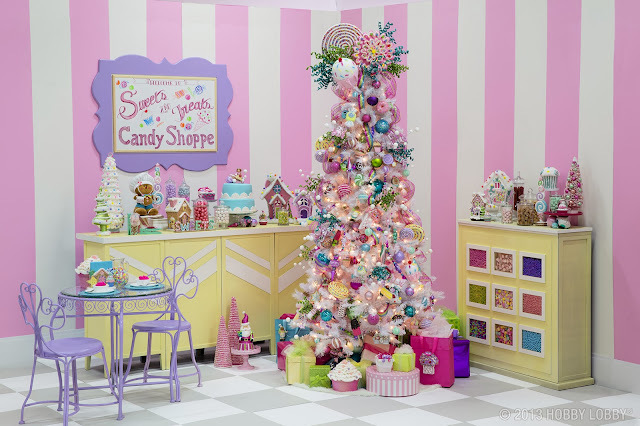 Immediately put colored sugar or sprinkles onto the apple then allow to set.